Mount Rushmore is a great place to not only sightsee but to learn about our nations history. I went there with my family and mother-in-law, no it was not that bad, I enjoy spending time with my wife�s mother and we get along very well. We had a great time and learned some about the history and how the great monument to some of our nations greatest people was made. We even got to spend some time with a man who helped make the statue and who has written a frequently asked question and answer book about it. The book is called Mount Rushmore Q&A by Don �Nick� Clifford, and is available on the Internet from the Mount Rushmore Bookstore. He returned and started the project, and through the years accomplished more than many thought possible. There was always problems, some small, and others so huge that many called for a halt to the whole project as a huge waste of money. One of the biggest but also the one that worked out for the best was the original positioning of Thomas Jefferson's sculpture. He had originally been positioned at the right of Washington, but due to faulty rock, was blasted away and repositioned to the left of our first President. Now Washington's face is predominate on the mountain and has a great profile. On October 31, 1941, the last drilling took place, and in the next few weeks scaffolds were removed and final cleaning was completed. The whole project was finished, in Lincoln Borglum's own words in his final report, �I do not think any more should be done on figures of the Memorial. It looks very well as it is and I think it is more effective this way, than if carried down as shown in the models.� He also commented that the Hall of Records should be completed but it was canceled by the Director of the Park Service. During the construction of the memorial, the government spent $836,000 on the project, with another $153,922.32 coming from fund raising events and from corporations and individuals, but the largest contributer of this money was Gutzon Borglum himself. Amazingly there were no deaths and only a couple of injuries during the entire project. This is a remarkable safety record due in large part to Borglum's insistence of safety by his men, things like safety harnesses and having sure footing on ledges before taking them off was important to him. 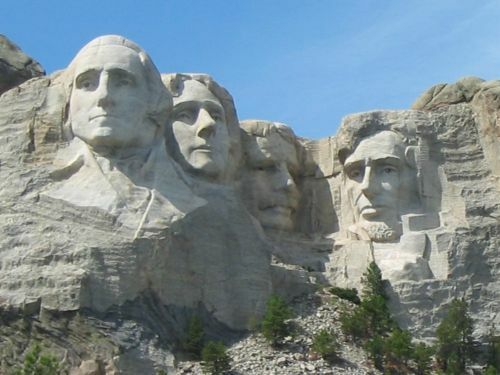 During the years that have followed, many things have been added to the foot of the mountain but nothing has been done to the original carving of the Presidents other than preventive maintenance. The cracks that are in the sculpture have to be sealed, allowing water in and freezing and thawing would cause cracks in the granite and pieces to fall off. This at first was done with Borglum's recipe of white lead, granite dust and with linseed oil to make a paste, but today is done with high tech modern substances, adhesive caulk and filler from Dow Corning. There is a trail that leads from the Grand View Terrace over looking the mountain called the President's Trail, it runs up to the foot of the sculpture and is less than a mile long. It does go up and down some stairs and can be a bit tiring, but is a great view of the mountain and you even have a chance to see some of the mountain goats that call the area home. 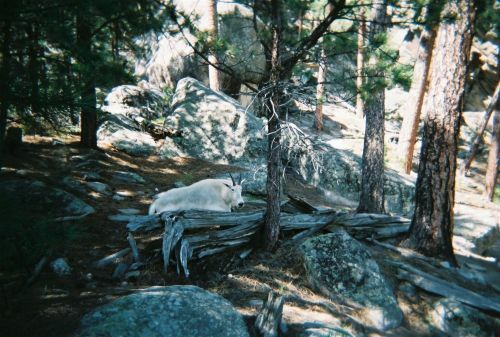 While my two sons and I were on the President's Trail, not ten feet off the deck of the trail was a mountain goat sitting on a rock under a pine, resting and keeping cool. He was panting like he had just done a run or whatever it is mountain goats do, probably climbing, and we could hear him clearly. He sat and watched us as we took a few pictures and then continued on our way. We then made our way to the sculptor's studio for more views of the tools and the model used to carve the mountain. There is a restaurant and snack shop along with the couple of gift stores and plenty of restrooms. We had an easy time getting around with my mother-in-law who isn't exactly sprinting marathons any more and had a great time, viewing the great monument and finding out about it's carving. 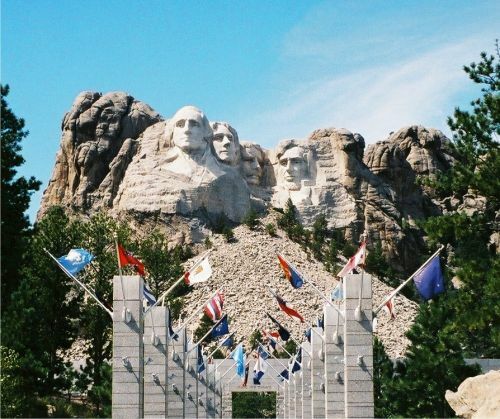 You can get plenty of information from the Park Service or the South Dakota Tourism for more things about Mount Rushmore.